PowerPoint is the standard for slide show software, but what if you can’t afford it? You can upload PowerPoint files that you create on your computer. Go to Windows Live Office Web Apps. Sign in using the link shown by the arrow below if you have a Live ID or a Hotmail account, or just register. After you sign into your account,you have two ways to start a new PowerPoint presentation. Either choose Office>New PowerPoint presentation from the top menu, or click the New drop-down list and choose PowerPoint presentation. 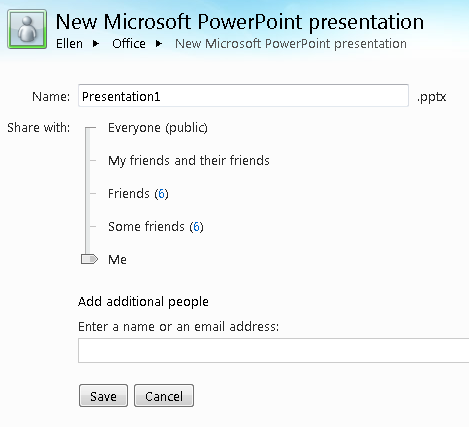 Name your new PowerPoint and choose whom you want to share it with, if anyone. 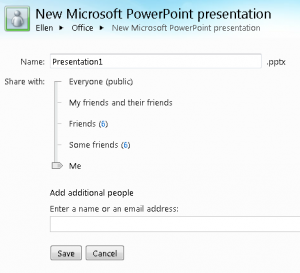 Then Click Save and you can start creating your new PowerPoint presentation. 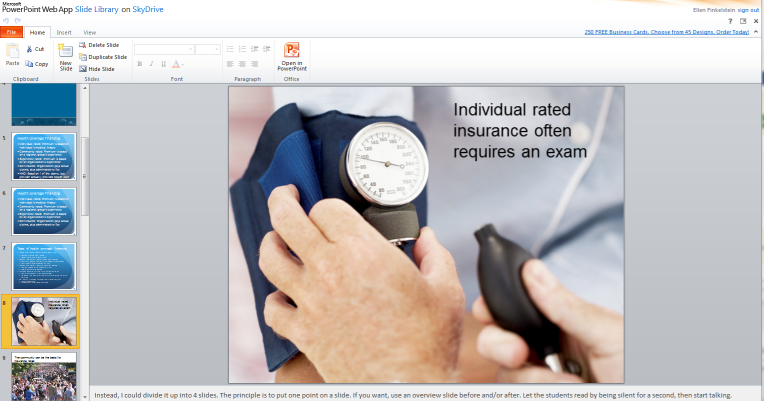 Work with your PowerPoint online or you can also click Open in PowerPoint to edit it on your local computer. (When I did this, I had to sign in again.) You’ll quickly see by the limited ribbon options that PowerPoint Online has limited features. You can choose from themes and layouts. Of course, you can insert text, pictures, clipart, and SmartArt if your layout includes a placeholder for them. The layouts are not flexible, unfortunately. You can also upload a PowerPoint presentation from your computer. From the main window, choose Add Files. Choose one of the existing folders and then browse to upload the file. You can then choose the file and choose Edit in Browser. From the View tab, you can switch to Slide Show view, which is a new browser window. You could use this in a webinar by sharing your desktop or in a live presentation by displaying the browser window. It’s a great way to have an online back-up copy of your presentation. 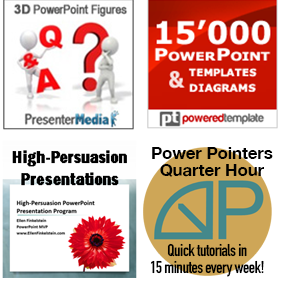 Have you used PowerPoint online? What do you think? I blog quite often and I truly appreciate your information. The article has truly peaked my interest. Im going to bookmark your blog and keep checking for new details about once a week. I opted in for your Feed as well.